Need a quick, easy and totally delicious dinner tonight? 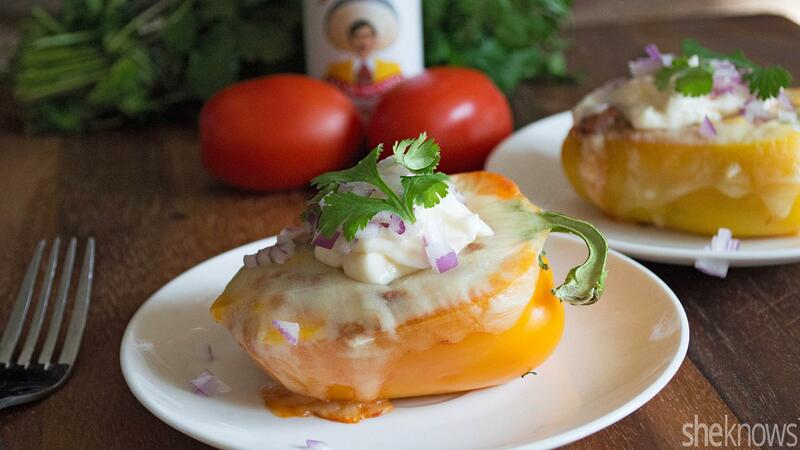 These stuffed peppers are super filling and vegetarian. They’re perfect for those family members who are meat-free or just wanting something different on their dinner plate for Meatless Monday. I used fresh bell pepper halves and filled them with pinto beans, tomatoes, onions, garlic, lots of Mexican spices and a thick slice of Monterey Jack cheese before popping them into the oven. Rather than sour cream, I finished off these peppers with a hefty spoonful of Greek yogurt, fresh cilantro and a little bit of red onion for a pop of color. These stuffed peppers also make great leftovers and freeze well for an easy dinner later. 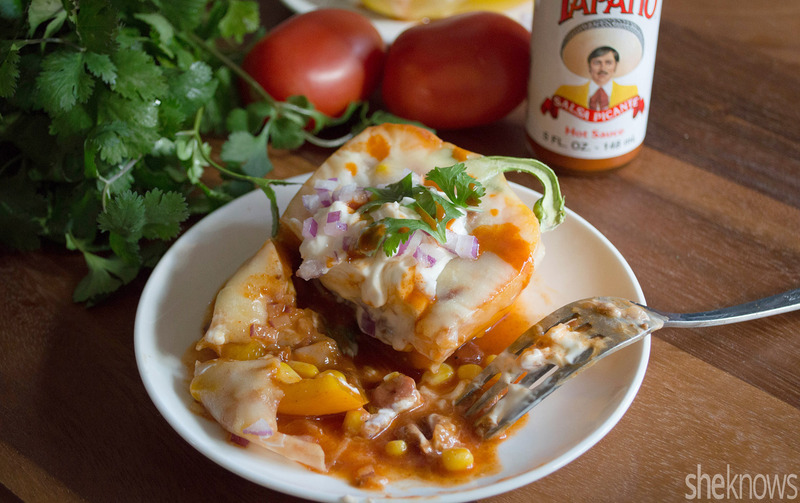 Bell peppers are loaded with a vegetarian-based bean chili and cheesy topping, then baked. Finish these off with cool, creamy Greek yogurt and fresh cilantro. Preheat the oven to 375 degrees F, and spray a large baking dish with nonstick cooking spray. Cut each pepper in half, and remove the seeds. Place the pepper halves into the baking dish. Heat a large pan over medium heat, and add the olive oil, onions and garlic. Cook for about 3 minutes or until soft. To the pan, add the beans, tomatoes, green chili peppers, corn and the envelope of chili seasoning. Mix well, and remove from the heat. Spoon the filling into each bell pepper. Once all the peppers are filled with the bean mixture, top each with a slice of Monterey Jack cheese. Bake uncovered for 25 minutes or until the cheese has melted and the tops of the peppers begin to brown. Garnish with Greek yogurt, cilantro, minced red onion and a few dashes of hot sauce, if desired. Best served warm.